Least bittern, photo by Danielle D’Auria. Wading birds are a diverse group of birds including herons, egrets, bitterns, ibises, coots, moorhens, rails, and sandhill cranes. The herons and egrets are large, long-legged, long-necked species that are typically seen wading in shallow water while searching for food. Bitterns, rails, and moorhens are smaller secretive species that hide amongst marsh vegetation and are typically only heard rather than seen. All of these species depend on healthy wetland complexes and often the surrounding uplands for breeding, feeding, and during migration. Wading bird breeding habitat includes upland and wetland areas used for courtship and mating, nesting, and rearing young. 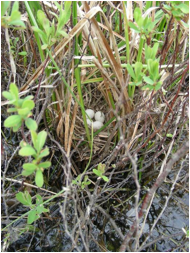 Herons and egrets nest in colonies, building stick nests in trees; whereas other wading birds nest close to the ground, building nests of reeds and grasses among wetland plants. The breeding season is when these birds are most susceptible to disturbance from humans including development, maintenance and construction activities, and recreation. It is also a time when adults are caring for young, creating a high demand for abundant, high quality foods. Freshwater wetland, photo by Brad Allen. Feeding habitats include areas used by adults, juveniles, and sub-adults or non-breeding birds. Wading birds feed on fish, amphibians, invertebrates, and plants found in shallow wetlands. Clean water that supports healthy populations of their prey is vital to their survival. Roosting and loafing habitats include areas used for resting and overnight roosting. Some species prefer dense vegetative cover, while others may prefer open areas for spotting potential predators. Migration habitat includes areas used for feeding, roosting, and loafing during spring and fall migration and post-breeding dispersal. Many wading bird species can be viewed as ecological indicators of the health of a wetland and the larger landscape setting. Stormwater runoff, sedimentation, and pollution can cause changes in water chemistry that in turn can lower the abundance of invertebrates, reduce plant diversity, and increase the presence of invasive, non-native plants. These changes can make the habitat unsuitable for wading birds and other wildlife. Those that eat fish and large invertebrates are positioned high on the wetland food chain, thus their health reflects the health of their prey, as well as that of the surrounding water, soil, and air. Protection of wading bird habitats provides direct benefits to the people of Maine who enjoy hunting, fishing, wildlife viewing and wildlife photography. The U.S. Fish and Wildlife Service recently reported that Maine is the top state in the country for wildlife watching activities and second for bird watching; both activities generate significant income for local communities. Virginia rail nest, photo by Ellen Robertson. Many wading birds approached extinction in the late 19th and early 20th century. The great and snowy egret were especially endangered by plume hunters. This slaughter spawned the establishment of the National Audubon Society and protective legislation for most birds. Since that time fortunately, populations of most species have rebounded substantially. Persistent pesticides caused eggshell thinning and reproductive problems in many birds, including the black-crowned night-heron. Many of these chemicals were banned in the United States in the 1970s, but are still used in Central and South America, where many of our breeding birds winter. In addition, there are new chemicals whose effects to wildlife and humans are still unknown. 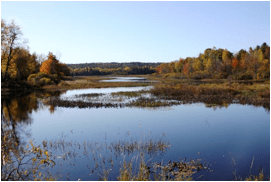 Both the Atlantic Northern Forest Bird Conservation Plan and the North American Waterfowl Management Plan have identified the loss of wetlands from draining, dredging, and filling as the primary threat to water birds in our region. The Mid-Atlantic/ New England/ Maritimes Region Waterbird Conservation Plan identifies human disturbance and conflicting land use as significant threats to regional water bird habitats. In addition, the colonial nature of some species makes them especially vulnerable to natural disasters. Those that nest in uplands are also vulnerable to logging, disturbance, and human development. 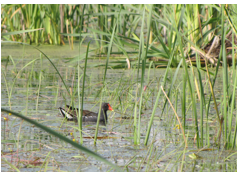 Common moorhen, photo by Danielle D’Auria. There are several wading bird species that have been listed in Maine as Endangered, Threatened, or Special Concern. Endangered species include the least bittern (Ixobrychus exilis), and two other species also associated with freshwater marsh habitats: the black tern (Chlidonias niger) and sedge wren (Cistothoris platensis). Threatened species include the black-crowned night-heron (Nycticorax nycticorax) and the common moorhen (Gallinula chloropus). Special Concern species include the great blue heron (Ardea Herodias), American coot (Fulica americana), and yellow rail (Coturnicops noveboracensis). In 2009, biologists with MDIFW started tracking wading bird colonies more closely due to the designation of the great blue heron as a species of Special Concern and the black-crowned night-heron as a State Threatened species. In order to gain a better understanding of the status of colonial wading birds in Maine, MDIFW also began a volunteer adopt-a-colony program in 2009 called the Heron Observation Network, or HERON for short. By adopting a colony, volunteers make observations at the colony during the breeding season and report the data back to MDIFW. Over time, this data will help to reveal population trends of each colonial wading bird species and help guide future management. Great blue heron colony, photo by Michael Merchant. MDIFW tracks approximately 100 active great blue heron colonies in Maine and has found volunteers to monitor many of them. However, there are still colonies that have not been adopted. Adoption includes a minimum of 1 visit during the peak of the breeding season which is mid-May to mid-June. For those with the interest and time, additional observations can be made at 2-week intervals in an effort to capture breeding effort and success information for the season. Observations are only done if disturbance to the nesting birds can be avoided. Binoculars are necessary, and a scope is often very helpful. Data recorded include the number of active and inactive nests, the breeding stage of each nest (incubation, nestling, fledgling), and the number of nestlings and fledglings seen. 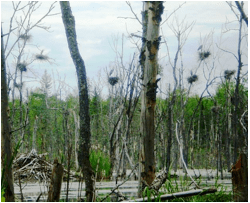 If you know of a wading bird colony, would like to learn more about the Heron Observation Network, or are interested in adopting a colony, please contact Danielle D’Auria at (207) 941-4478, or danielle.dauria@maine.gov . 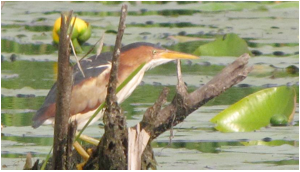 For more information about the Heron Observation Network, visit the HERON blog, or join us on Facebook .